A 31-year-old Korean-American man faces a probe in South Korea for alleged unruly behavior on a flight bound for Seoul from Los Angeles, police said Thursday. The man caused a disturbance, including using abusive language, threats and violence, during the flight, according to Korean Air Lines Co., South Korea's national flag carrier. He is also accused of breaking one of the plane's inner plastic window panes by throwing his tablet computer as the plane was landing at Incheon International Airport early Wednesday. He was immediately taken to police upon arriving the airport before being allowed to leave with a relative. "We will summon the man in the coming days for questioning," a police officer handling the case said by phone from Incheon. The officer spoke on condition of anonymity and said that the suspect was "a bit mentally strange" but not drunk. The officer did not identify the suspect. The man could face charges of violating South Korea's Aviation Security Act, violence and damage to property, the officer said, adding that police will refer the case to prosecutors after carrying out a probe. 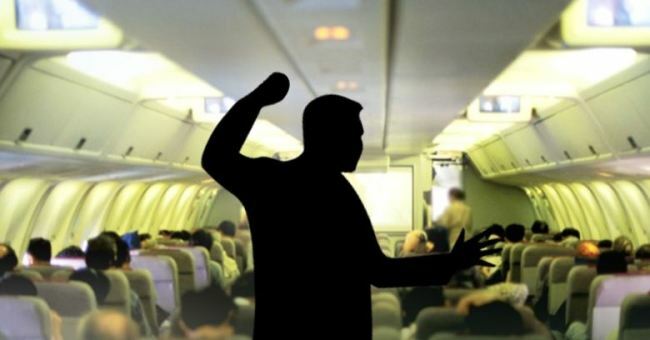 The number of incidents of in-flight violence more than doubled to 460 cases in 2016 from 191 in 2012, according to government data.